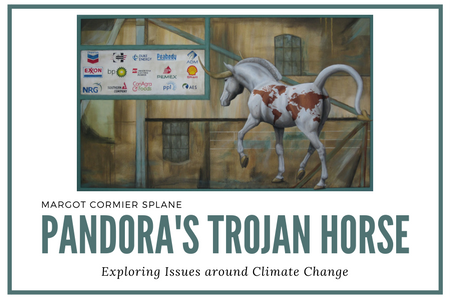 Internationally Award Winning local artist Margot Cormier Splane explores the high environmental cost of industrial growth in her series of acrylic paintings and hand-pulled serigraphs. Central to her works is the figure of Pandora’s Trojan Horse, portrayed as a horse with the horns and tail of a devil with a map of the world on its torso, a symbol of the hidden danger of progress and development. Each painting and serigraph in the series looks at an individual area of environmental concern. The artist performs extensive research on each topic and through her artwork, seeks to invite audiences into a conversation about environmental preservation and the future of our planet.